All the way from Mexico, Frankmysterio brings us Panchito, an adorable axolotl. Panchito is designed by Frankmysterio, modeled by Erick Pacheco and produced in collaboration with Viniles Chiles. He is on the chubby side of things, but who doesn’t love a chubby axolotl? Panchito measures a nice 14 x 7,5 cm (5,5 x 3 inch) and is available in two different colourways. 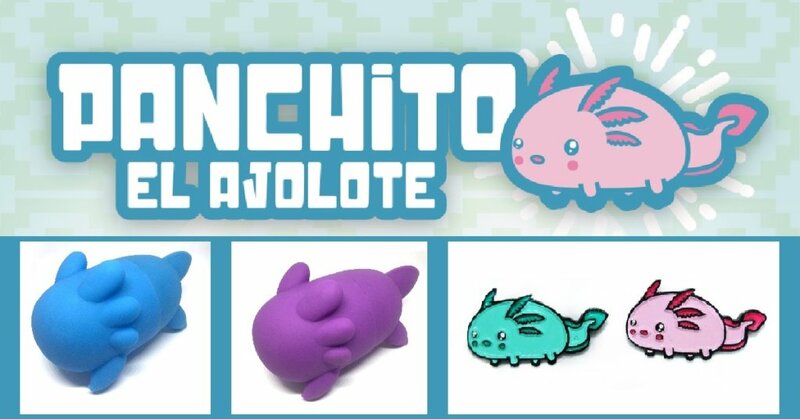 Limited to 35 pieces each, this axolotl will sure melt some hearts. Perfect to display as is or customize to your own liking, you can get your own Panchito here for $35 (or around 27 GBP) a piece. Ofcourse all the pin lovers out there aren’t forgotten. You can get your own pink or green Panchito pin for only $10/7,50 GBP. You can find Frankmysterio on Facebook and Instagram.